So take a good look, and then go fill out this form. This contest is being hosted by both The Book Rat and Books from Bleh to Basically Amazing, so to ensure we don't have a lot of accidental double entries, we are requiring that you leave a comment on the blog that you entered from. Must fill out the form above and comment on this post. Please make sure to only enter once! *There was a little bit of an oops with Meghan, who is currently out of the country. So winner will have their choice between a copy of Anahita's Woven Riddle that was accidentally signed to "Misty" or a clean, unsigned copy, provided by Misty. Please indicate in the form which you'd prefer. 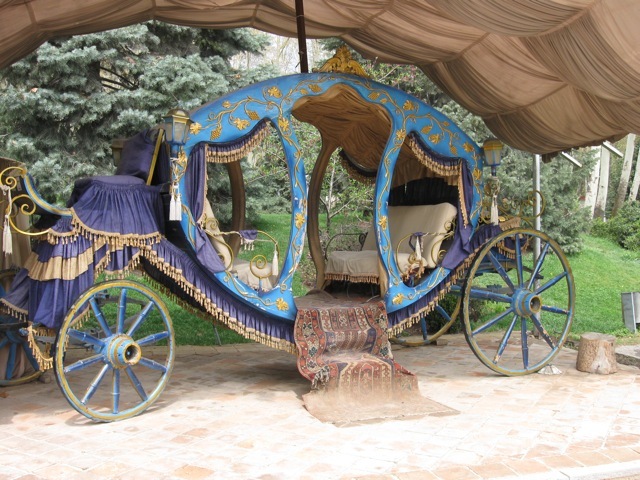 Gorgeous carriage! Blue is my favorite color. This is fun, and what a pretty carriage. Cool contest! Love the carriage. That is a gorgeous carriage, and I love the fact that is blue. such a magical carriage. can i take a ride? I love it. If I ever have a girl I am SO making Mr. Whimsy build a carriage bed. Amazing! Thanks for the giveaway. What a gorgeous carriage! I'd love to know how they decorate the horses that pull it. Thank you for the giveaway and what a beautiful carriage. would love to have a ride in it! Ooooh! :) Thanks for the giveaway. That's a lovely carriage. Very pretty carriage, I wonder how close my guess is, lol. Such a pretty carriage. Hope I guessed correctly. Thanks for the giveaway! Love the carriage! Pretty carriage! Thanks for the giveaway! It's a beautiful carriage but really just guessing where from.